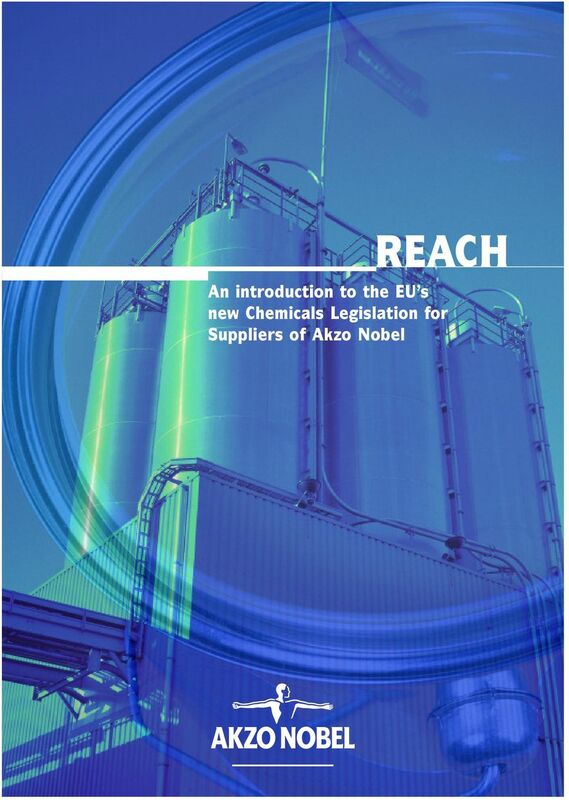 Download "REACH An introduction to the EU s new Chemicals Legislation for Suppliers of Akzo Nobel"
2 REACH stands for Registration, Evaluation, Authorisation and Restriction of Chemicals What is REACH? 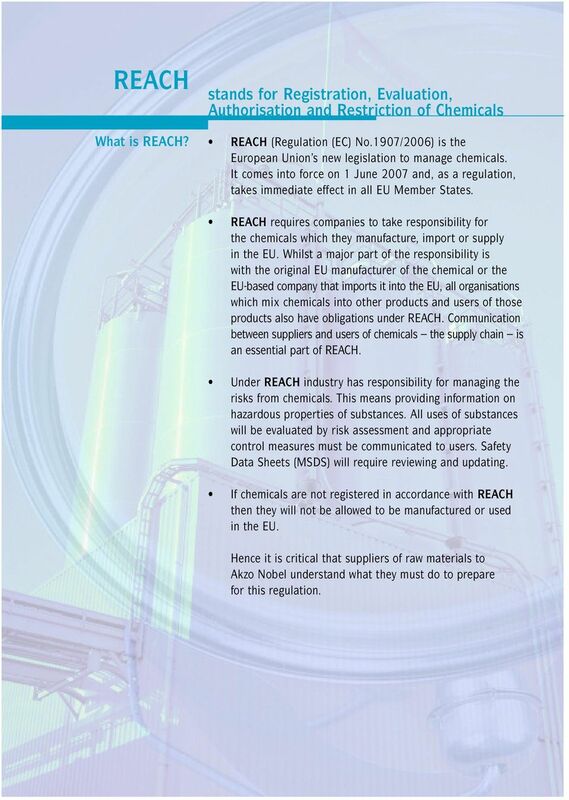 REACH (Regulation (EC) No.1907/2006) is the European Union s new legislation to manage chemicals. It comes into force on 1 June 2007 and, as a regulation, takes immediate effect in all EU Member States. 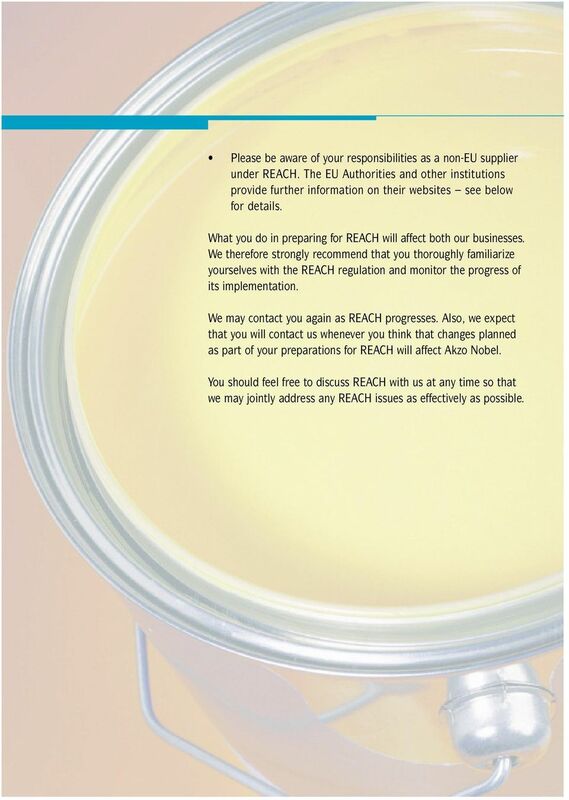 REACH requires companies to take responsibility for the chemicals which they manufacture, import or supply in the EU. Whilst a major part of the responsibility is with the original EU manufacturer of the chemical or the EU-based company that imports it into the EU, all organisations which mix chemicals into other products and users of those products also have obligations under REACH. 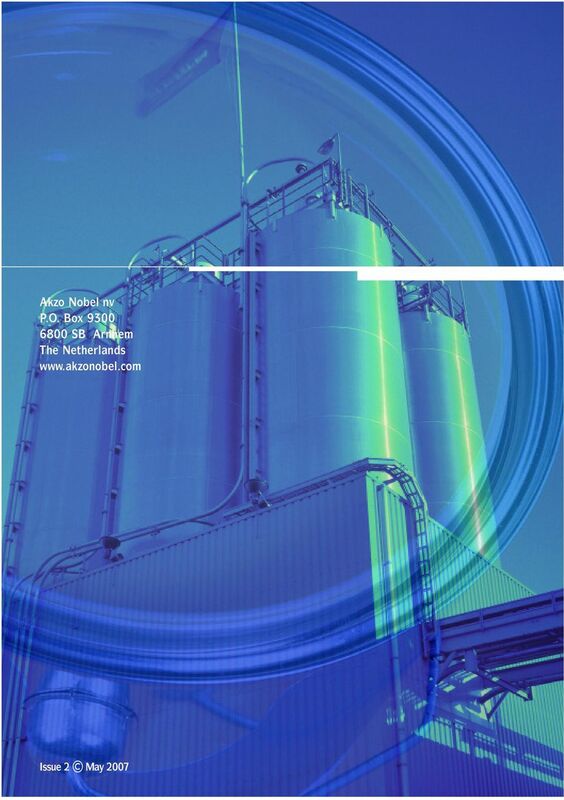 Communication between suppliers and users of chemicals the supply chain is an essential part of REACH. Under REACH industry has responsibility for managing the risks from chemicals. This means providing information on hazardous properties of substances. All uses of substances will be evaluated by risk assessment and appropriate control measures must be communicated to users. Safety Data Sheets (MSDS) will require reviewing and updating. If chemicals are not registered in accordance with REACH then they will not be allowed to be manufactured or used in the EU. Hence it is critical that suppliers of raw materials to Akzo Nobel understand what they must do to prepare for this regulation. 3 What will you have to do under REACH? What we want you to do is completely in line with the approach that is communicated by CEFIC for manufacturers or importers. If you are a downstream user only (i.e. you do not manufacture or import the substance(s) yourself), you have to assure that your suppliers take care of the following. Pre-registration The key first stage of REACH. 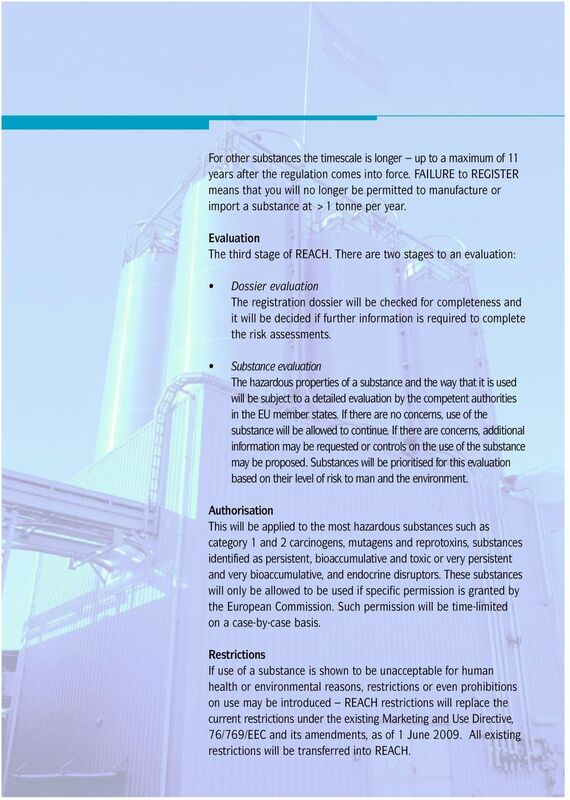 All substances currently in use in the EU must be pre-registered by each manufacturer and importer between 1 June 2008 and 1 December FAILURE to PRE- REGISTER means that you will no longer be able to manufacture, import or supply in the EU a substance after 1 December 2008 without a full registration. Pre-registration will be a simple process involving supply of basic information on substances and the amounts manufactured in or imported into the EU. 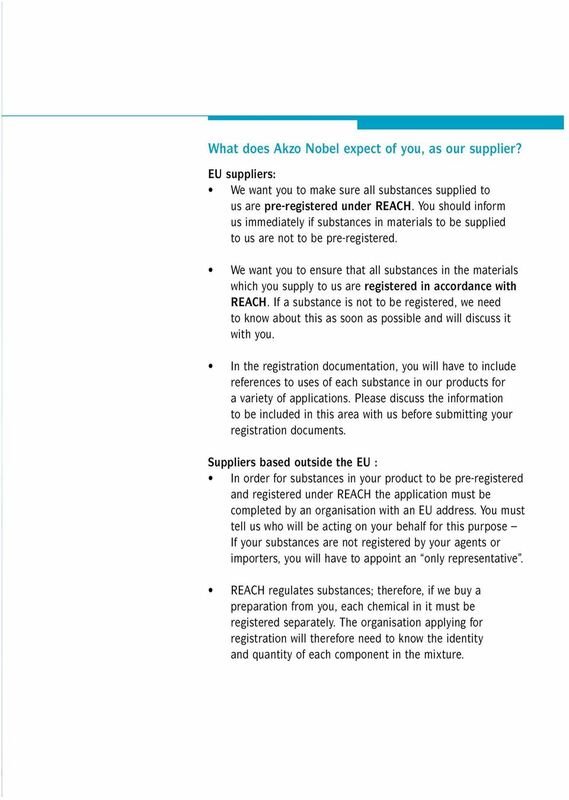 It is imperative that all substances used in Akzo Nobel products manufactured or used in the EU are pre-registered by our suppliers. Registration The second stage of REACH. All substances manufactured in or imported into the EU at more than 1 tonne/year/manufacturer or importer have to be registered. This will involve the submission of a dossier of data to the European Chemicals Agency in Helsinki. This dossier has to include data on the hazardous properties of the substance, its uses and, in most cases, a risk assessment (Chemical Safety Report) covering each different type of use. The actual data in the dossier and when the registration has to be submitted will depend on the hazards of the substance and the amount manufactured or imported by each company. The first substances to require registration will be those classified under EU law as category 1 and 2 carcinogens, mutagens and reprotoxins; those classified as R50/53, (Very toxic to aquatic organisms, may cause long term adverse effects in the aquatic environment) and manufactured or imported at >100 tonnes/year; and substances manufactured or imported at >1000 tonnes/year per manufacturer. These substances will have to be registered by 1 December 2010. 4 For other substances the timescale is longer up to a maximum of 11 years after the regulation comes into force. FAILURE to REGISTER means that you will no longer be permitted to manufacture or import a substance at >1 tonne per year. Evaluation The third stage of REACH. There are two stages to an evaluation: Dossier evaluation The registration dossier will be checked for completeness and it will be decided if further information is required to complete the risk assessments. Substance evaluation The hazardous properties of a substance and the way that it is used will be subject to a detailed evaluation by the competent authorities in the EU member states. If there are no concerns, use of the substance will be allowed to continue. If there are concerns, additional information may be requested or controls on the use of the substance may be proposed. Substances will be prioritised for this evaluation based on their level of risk to man and the environment. Authorisation This will be applied to the most hazardous substances such as category 1 and 2 carcinogens, mutagens and reprotoxins, substances identified as persistent, bioaccumulative and toxic or very persistent and very bioaccumulative, and endocrine disruptors. These substances will only be allowed to be used if specific permission is granted by the European Commission. Such permission will be time-limited on a case-by-case basis. Restrictions If use of a substance is shown to be unacceptable for human health or environmental reasons, restrictions or even prohibitions on use may be introduced REACH restrictions will replace the current restrictions under the existing Marketing and Use Directive, 76/769/EEC and its amendments, as of 1 June All existing restrictions will be transferred into REACH. 5 What does Akzo Nobel expect of you, as our supplier? 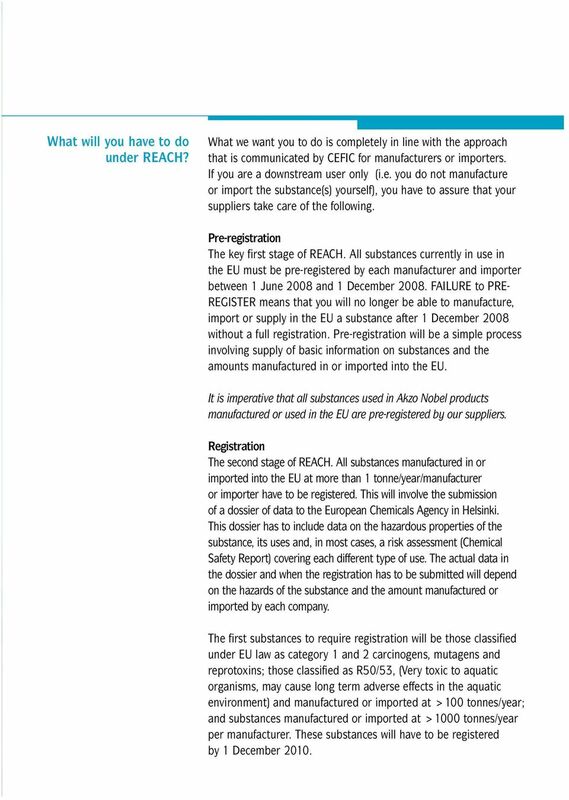 EU suppliers: We want you to make sure all substances supplied to us are pre-registered under REACH. You should inform us immediately if substances in materials to be supplied to us are not to be pre-registered. We want you to ensure that all substances in the materials which you supply to us are registered in accordance with REACH. If a substance is not to be registered, we need to know about this as soon as possible and will discuss it with you. In the registration documentation, you will have to include references to uses of each substance in our products for a variety of applications. Please discuss the information to be included in this area with us before submitting your registration documents. Suppliers based outside the EU : In order for substances in your product to be pre-registered and registered under REACH the application must be completed by an organisation with an EU address. You must tell us who will be acting on your behalf for this purpose If your substances are not registered by your agents or importers, you will have to appoint an only representative. REACH regulates substances; therefore, if we buy a preparation from you, each chemical in it must be registered separately. The organisation applying for registration will therefore need to know the identity and quantity of each component in the mixture. 6 Please be aware of your responsibilities as a non-eu supplier under REACH. The EU Authorities and other institutions provide further information on their websites see below for details. What you do in preparing for REACH will affect both our businesses. We therefore strongly recommend that you thoroughly familiarize yourselves with the REACH regulation and monitor the progress of its implementation. We may contact you again as REACH progresses. Also, we expect that you will contact us whenever you think that changes planned as part of your preparations for REACH will affect Akzo Nobel. You should feel free to discuss REACH with us at any time so that we may jointly address any REACH issues as effectively as possible. 7 This brochure gives only a simple overview of the REACH Regulation. For further details and to keep up-to-date with developments please see the European Commission REACH websites or contact your trade association. 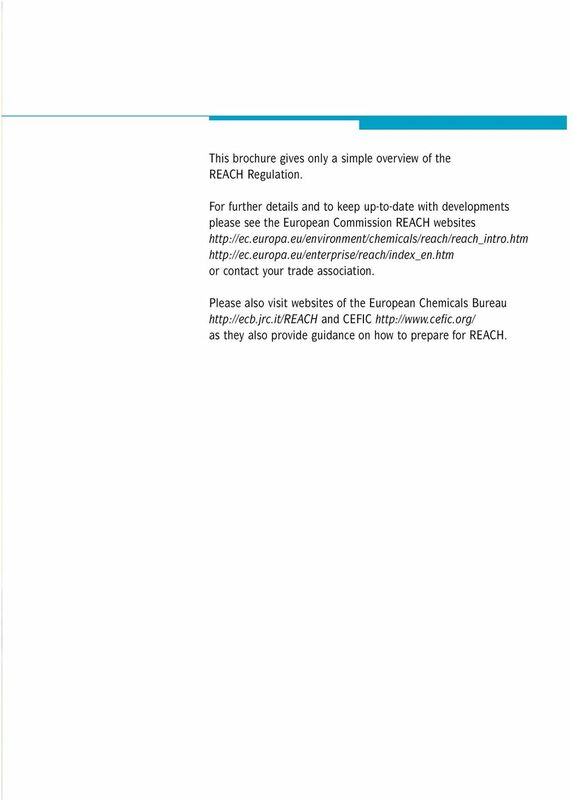 Please also visit websites of the European Chemicals Bureau and CEFIC as they also provide guidance on how to prepare for REACH. New classification for formaldehyde and styrene: make sure that your classification, label and safety data sheet (SDS) are correct!